The results of the World Book Talk Championship are in! We started with 16 educators who each created a 30 second book talk. After thousands and thousands of votes only one book talk remains. 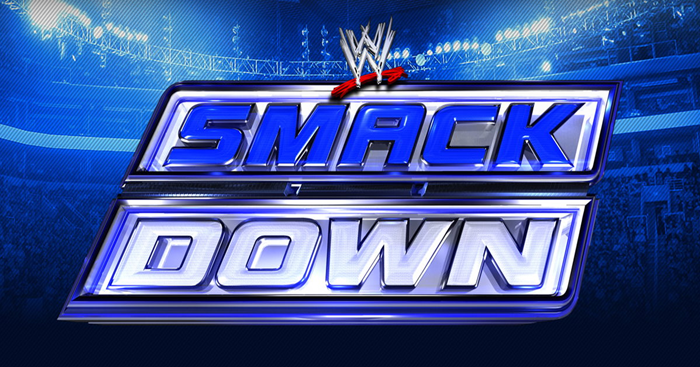 Who will be victorious? Will it be the Lead Learners or Literacy Legends? Watch the short (3 minute) episode of the #30SecondTake podcast below to see who won the Super Bowl of book talks. In the podcast, guest-host Jennifer LaGarde (a.k.a. Library Girl) helps announce the winner of the highly coveted “Vince Lombooki” trophy and reveals the best book talk in the world. Click on the bracket above to view the final results video! (To see how the Super Bowl of book talks began you can click HERE or HERE.) If you’re looking for resources to support students in creating their own 30 second book talks you can connect directly with Jen LaGarde. 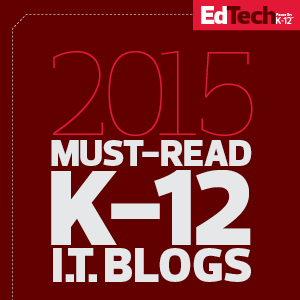 She’s compiled rubrics, bracket templates, and more. When kids read, create, and communicate their learning is amplified!! Jen and I would like to thank Oliver Schinkten for sharing his time and talents throughout the entire project. After all, it would not have been the book talk Super Bowl without some fun literacy-themed commercials. Thank you, Oliver! There is no doubt about it. We LOVE to read and we want to cultivate that same love of reading in our students. One way we can do this is by talking about the books we love and involving our kids in the process. Jen LaGarde and I are teaming up to bring you the World Book Talk Championship. This is the Super Bowl of book talks. (We even included a few fun reading-themed commercials to complete the Super Bowl feel.) 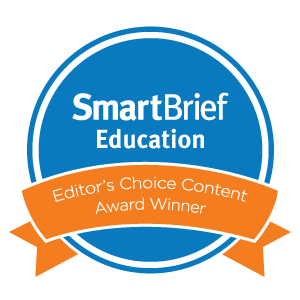 We started with 16 incredible educators who each submitted a short book talk video. We’re down to four finalists and we need your help. Who will win the coveted “Vince LomBooki” award for best book talk in the world? It’s “I Love to Read Month” and we’re feeling the love! Click HERE to view the championship round of the podcast. In the eight minute video you’ll see two “Literacy Legends” take on two “Lead Learners,” but only one person can hoist the championship trophy. YOU decide! 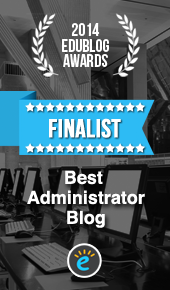 Click HERE to cast your vote online…voting is open through February. We’re also seeing classrooms create their own versions of the #30SecondTake book talks too. We’d love for you to share these with us as well. Most importantly…keep reading! Special thanks to Oliver Schinkten…his creative genius elevated our Super Bowl commercials to an entirely new level. It’s finally here…the Super Bowl of Book Talks! Jennifer LaGarde and I are teaming up to bring you 16 educators sharing their favorite books in 30 seconds or less! Just for fun we divided the educators into divisions. Jen is heading up the Literacy Legends, and I’m rooting for the Lead Learners. The only question is…who will take home the “Vince Lombooki” trophy?! This podcast features all the thrills of the Super Bowl…including some amazing commercials! Watch the podcast and then vote for who is moving to the next round using the online link below. Vote for your favorite book talk today! Click HERE for our online voting ballot. Round 1 voting closes Sunday, February 7, 2016 at 10:00pm CST. Vote for one book talk from each bracket to advance to the Super Bowl. Pick the winner based on pure passion or perhaps try a more objective approach…the choice is yours! Click HERE for a classroom book talk rubric shared by Jennifer LaGarde. Special thanks to Oliver Schinkten for his creative genius, as well as all 16 of the educators who shared their #30SecondTake book talks. Join classrooms across the country as we celebrate the books we love on Friday, January 15, 2016 at 9:30am CST. Be sure to add the #StuConnect hashtag to your classroom tweets when responding to the questions below. Q1 What book are you reading independently right now? What book is your teacher reading aloud to you? Which would you recommend?! Q2 If you could meet a favorite character from a book, who would you choose? Q3 What’s on your classroom’s Top 10 “Must Read” list? Q4 If you could create a new book award what would you name it? What book would you nominate and why? The entire twitter chat will only last 15-30 minutes. Feel free to join us for one question or stick around for the entire chat. All grade-levels are welcome to participate. We will share out a new question every five minutes or so. Classrooms can respond to specific questions by starting their Tweets with the letter “A” (stands for Answer) and adding the hashtag #StuConnect to the very end of each Tweet. Feel free to prepare pictures and video ahead of time. For example, if your students would rather design a new book award drawing to respond to question four they are more than welcome to. Creativity is appreciated, but a love of literacy and cultivating digital leadership skills are the ultimate goals! 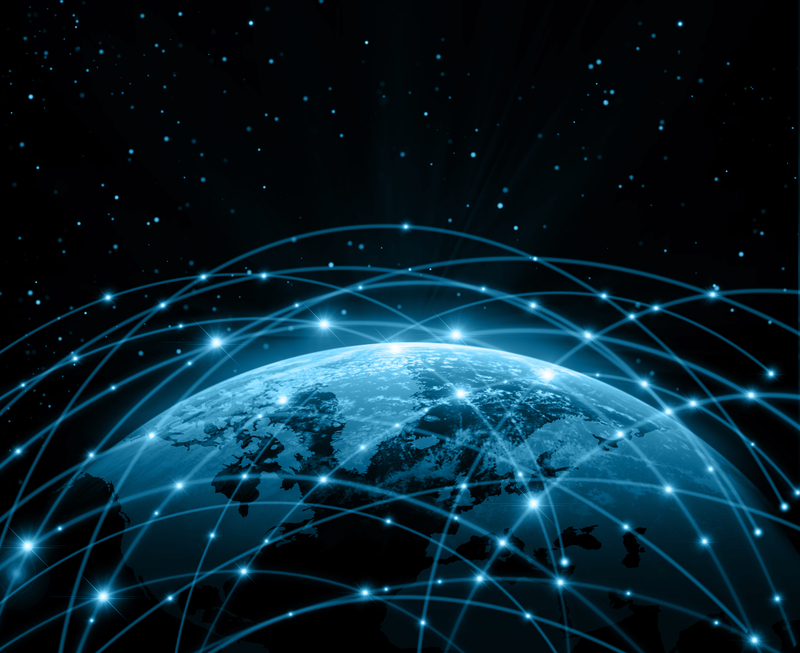 Special thanks to my friends and #StuConnect co-moderators John Fritzky (NJ) and Tony Sinanis (NY). We’ll also be joined by a Greenwood student serving as honorary co-moderator and “Principal for the Day!” We hope you can join us for the live Twitter chat at 9:30am CST on Friday, January 15th. 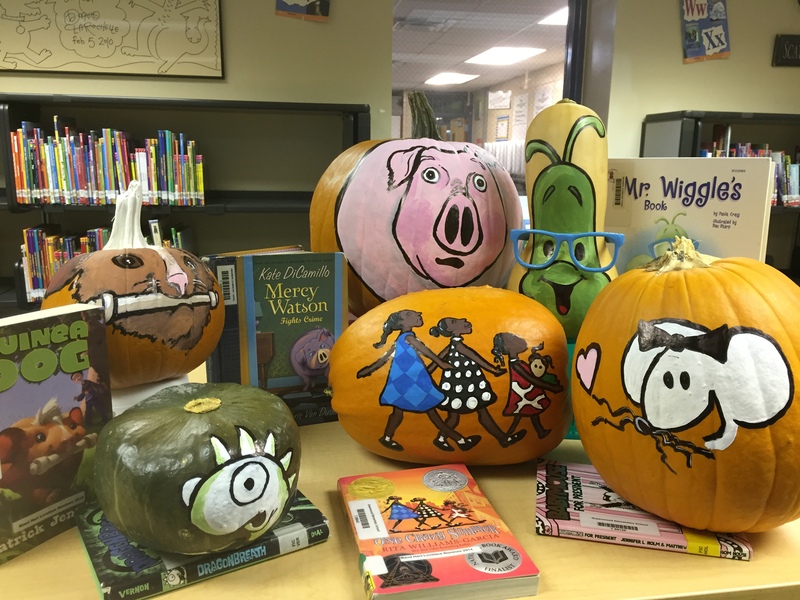 Every fall our Media Center is transformed into a whimsical pumpkin patch displaying “Literacy-O-Lanterns” from books our students love. This year I thought I’d introduce the new characters along with some past pumpkins as well. 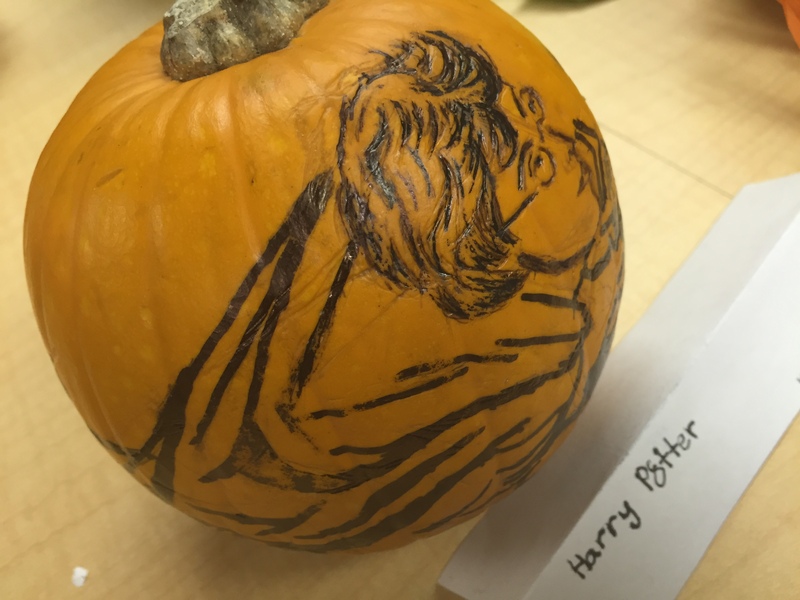 Painting the pumpkins is fun, but the thing that I’m most excited about is how our students are absolutely crushing creativity with their pumpkin designs. 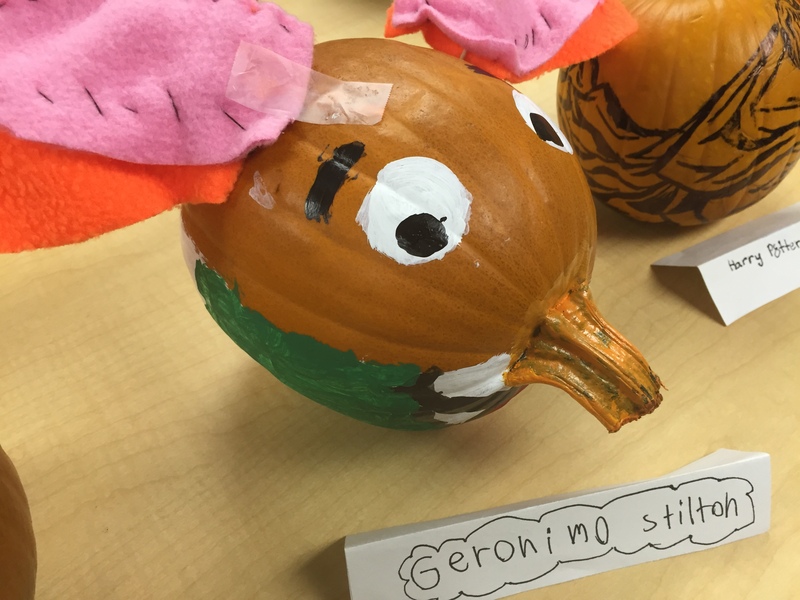 Our entire 3rd grade team is in on the fun…that means more than 150 pumpkins are now on display. 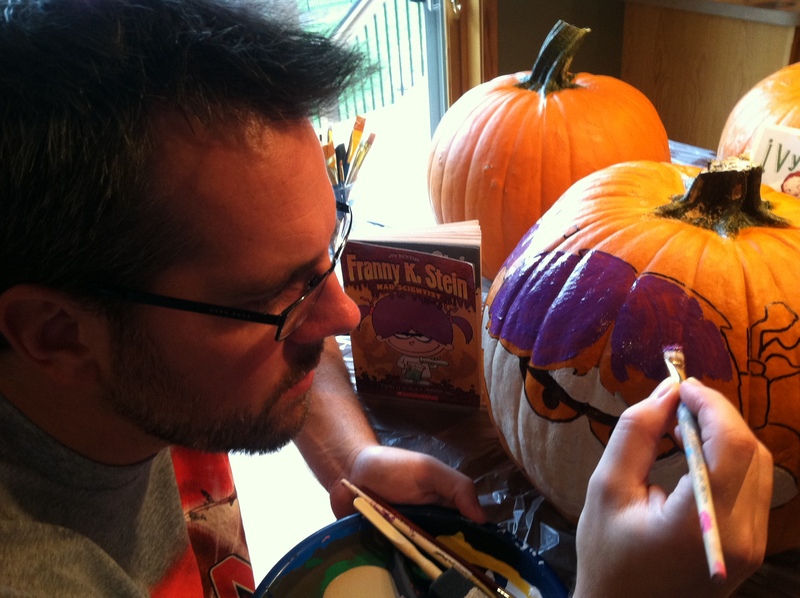 As you can probably imagine, all of the pumpkins are pretty awesome. I’m sharing a few student projects that used different media to capture the personality of their respective characters below. 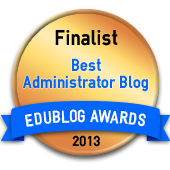 A few educators have inquired about how we do this…so here’s a final picture that pretty much sums it up! 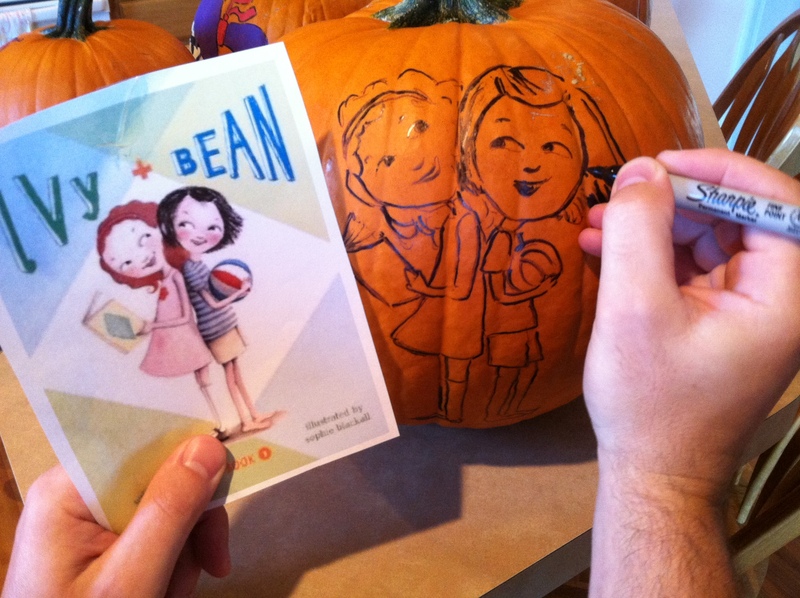 The crop of characters always starts by drawing a Sharpie outline on a pumpkin. The outline is then painted with acrylic paint. 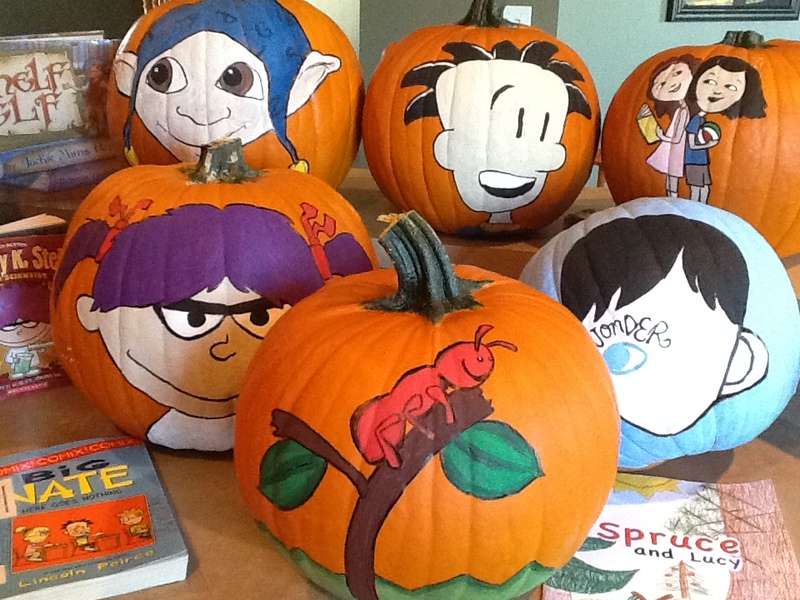 It’s fun to see all of the pumpkins scattered throughout the Media Center and kids LOVE them too. The overarching goal is to celebrate reading and grow a culture of literacy. 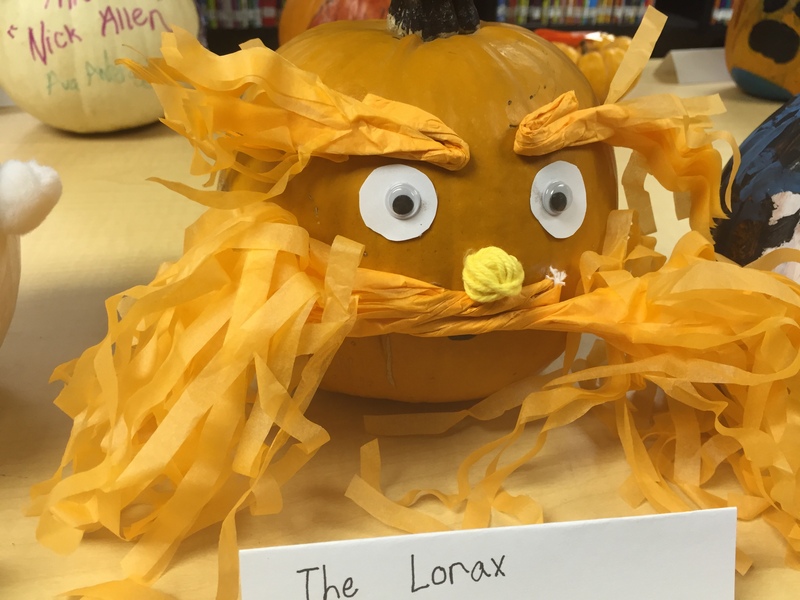 Be sure to check out Twitter and search for the hashtag #LiteracyOLanterns to see some additional pumpkins from students in other schools. We teamed up with the kids from Cantiague Elementary in New York and Byram Intermediate School in New Jersey to share our favorite books. Our kids created their collaborative podcast to inspire the most awesome summer of reading EVER. They packed nearly 30 book recommendations into this action-packed five minute podcast. Checkout what K-8 students are reading across the country! We hope you will share what you plan to read this summer too. You can start by answering the same question our students responded to, “What’s your one book?” Post a picture of your book to the hashtag #StuConnect on Twitter. Let’s celebrate with our students and join them in their reading awesomeness! *Special thanks to my friends Mr. John Fritzky and Dr. Tony Sinanis who helped amplify student voice and create this cross-state podcast. This past month a team of educators from across the country collaborated to create an epic ConnectED BINGO game for students. The opportunity was created by John Fritzky (NJ), Tony Sinanis (NY), and me. Our students have been connecting for close to two years now on collaborative cross-state podcasts. The ConnectED BINGO game was our attempt to include EVERYONE in a connected celebration of literacy and learning. 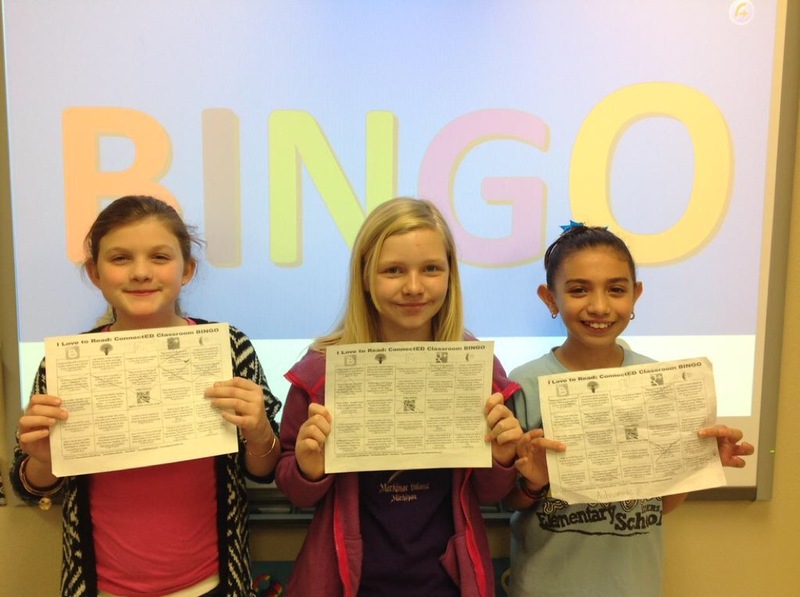 We know that many classrooms are still plugging away on their BINGO boards, and we encourage everyone to keep connecting and sharing. You can see all the exciting work kids are doing on the Twitter hashtag #StuConnect. We’re also excited to announce the first round of winners from the collaborative cross-state BINGO game. More winners will be announced soon. To claim your prize please send me a direct message (DM) on Twitter with your school’s address. Please share a Tweet with a picture of your book/prize to the #StuConnect hashtag on Twitter after you receive it. (We had some amazing authors donate books, and it would be great to thank them for their support.) More prizes will be randomly drawn soon.